2017 ABOG Fellows (clockwise, from top left): Freeman Word, Aviva Rahmani, Ashley Sparks, Rick Lowe, Ronny Quevedo, Stephanie Dinkins, Hello Velocity, and jackie sumell. 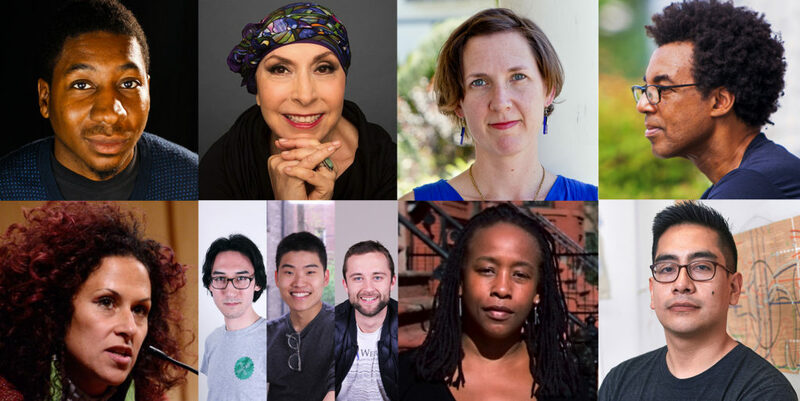 A Blade of Grass is pleased to announce our 2017 cohort of ABOG Fellows for Socially Engaged Art. Artists Stephanie Dinkins, Rick Lowe, Ronny Quevedo, Aviva Rahmani, Ashley Sparks, jackie sumell, Freeman Word, and art collective Hello Velocity will join a growing body of artists and artist collectives that A Blade of Grass collaborates with and directly supports. At the core of the program is the ongoing goal to build a body of field research, films, publications, public programs and web content that highlight the expanding practice of socially engaged art at the intersection of art and social change. The 2017 Fellows will realize projects in New York City, New Orleans, St. Louis, rural Virginia, and at documenta 14 in Athens, Greece, where they will be exploring issues of digital equity, immigrant rights, gentrification, and environmental and racial justice, among others. The final eight projects were chosen by two selection committees from an initial pool of 534 applicants, the largest A Blade of Grass has received to date. These applicants were elected as leading examples of artists engaging community members as equal partners in ambitious and creative collaboration. Artist STEPHANIE DINKINS will create Project al-Khwarizmi (PAK) with artists, youth, and elders of color to address digital discrimination within artificial intelligence (AI) systems. Working alongside computer and data scientists, Dinkins and collaborators will develop a web-based chatbot to empower communities of color to understand how algorithms and AI systems impact daily life, and create a more culturally inclusive prototype. Click here to learn more. Working collectively as HELLO VELOCITY, artists Lukas Bentel, Kevin Wiesner, and JS Tan will create Gradient, an e-commerce plugin that prices products higher or lower depending on a customer’s income level. Leveraging their design, marketing, and technical expertise, Hello Velocity will use Gradient to demonstrate an equitable pricing system to a mass consumer audience. Click here to learn more. Artist RICK LOWE will create the Victoria Square Project using the opportunity of documenta 14 to consider the situation of immigrants and refugees in relation to native Athenians in Victoria Square, Athens. Working collaboratively with local partners, the project will operate long-term to assure that the positive value and assets of immigrants and refugees are integrated into the overall changing narrative of Victoria Square. Click here to learn more. Artist RONNY QUEVEDO will create Higher Sails in the Mott Haven section of the Bronx, transforming small businesses into social agents by broadcasting community concerns through store signage, awnings and other graphic materials, and encouraging residents to respond to the impact of gentrification through art and design. Click here to learn more. in prospective US pipeline locations in collaboration with scientists, and copyright, environmental policy, and real estate lawyers. Utilizing site-specific painting to create “tree-notes” on private land facing condemnation for eminent domain, Rahmani will create copyright-protected sonified biogeographic sculptural compositions to halt proposed pipeline expansion. Rahmani is the inaugural ABOG Fellow for Contemplative Practice, in partnership with the Hemera Foundation. Click here to learn more. Theater maker ASHLEY SPARKS will create Good Old Boys, a portable participatory performance for white southern male audiences in rural Virginia. Incorporating remote control cars, music, and characters inspired by the Dukes of Hazzard, the show draws upon Sparks’ experience as a Southerner, and explores themes of class, race, privilege, and power through intimate reframing of pop culture. Click here to learn more. Artist JACKIE SUMELL will create The Garrison, a mobile classroom for prison abolition. During a three-month, multi-state tour, sumell will collaborate with local partners to facilitate restorative justice forums and establish “Solitary Gardens,” cell-sized garden beds created through correspondence with incarcerated individuals. sumell is the 2017 ABOG-David Rockefeller Fund Joint Fellow in Criminal Justice. Click here to learn more. Artist FREEMAN WORD will create Zakatu Madrasa, a cooperatively owned and operated spiritual subscription bookstore in St. Louis. Referring to East African educational institutions (both secular and religious), the Madrasa will bring together artists, educators, activists and young people of color to co-create art addressing regional social issues. Click here to learn more. A Blade of Grass is committed to presenting stories about artists working as creative change makers. In an effort to expand how this type of work is supported, the selected projects become the focus of ABOG’s public programming, short documentary films, field trips, web content, and publication series. To complete their projects, each ABOG Fellow will receive a suite of resources, including a dedicated field researcher, the production of a short documentary film through A Blade of Grass’ FIELDWORKS series, in-person retreats with other Fellows, staff, and facilitators, access to a network of contacts and partners in the field of socially engaged art and beyond, and an unrestricted stipend of $20,000. To nurture this growing movement of artists working as creative change makers in communities, A Blade of Grass is proud to work in partnership with David Rockefeller Fund and the Hemera Foundation on issue-based fellowships. Now in its second year, the ABOG-David Rockefeller Fund Joint Fellowship in Criminal Justice examines the transformational roles artists play in a criminal justice context. In partnership with the Hemera Foundation, the new ABOG Fellowship in Contemplative Practice supports artists who work at the intersection of social practice and contemplative practice. The ABOG Fellowship for Socially Engaged Art is made possible through the generous support of over 100 individual contributors and foundation and government partners. We are grateful for major contributions from the Hemera Foundation, David Rockefeller Fund, National Endowment for the Arts, Rockefeller Philanthropy Advisors, and Groundbreakers Agnes Gund, Eva Haller, Shelley Frost Rubin, and Linda Schejola. Related public programs are supported, in part, by public funds from the New York City Department of Cultural Affairs in partnership with the City Council. Photo credits (clockwise, from top left): Freeman Word. Photo: Jennifer Korman Photography. Aviva Rahmani. Photo: Joe Gaffney. Ashley Sparks. Photo: Courtesy the artist. Rick Lowe. Photo: John D. & Catherine T. MacArthur Foundation. Ronny Quevedo. Photo: Argenis Apolinario. Stephanie Dinkins. Photo: Courtesy the artist. Hello Velocity. Photo: Courtesy the artists. jackie sumell. Photo: Courtesy the artist.